This is a story of the growth of the Faith in a remote rubber plantation called Kinta Valley Estate near the town of Batu Gajah, in the state of Perak, Malaysia. Since the Faith was introduced in this estate, there was an unprecedented expansion and consolidation of the community within a very short period, filled with hive of activities rarely heard of elsewhere. The meteoric rise of the Faith in this estate drew not only attention from all over Malaysia but also attracted many visitors from all over Malaysia and abroad. Unlike other rubber estates in Malaysia, this estate enjoyed an envious quality of life. The estate was owned by Britishers who kind to the workers were and likewise the labourers too loved the managers. On the birthdays of the managers, cakes, biscuits and sweets were distributed to the children of the workers. There were four Hindu temples within the estate, and temple festivals held on a very grand manner with chariot processions, attracting hundreds of devotees from many parts of the state of Perak. Inter-estate football matches drew large attractions. 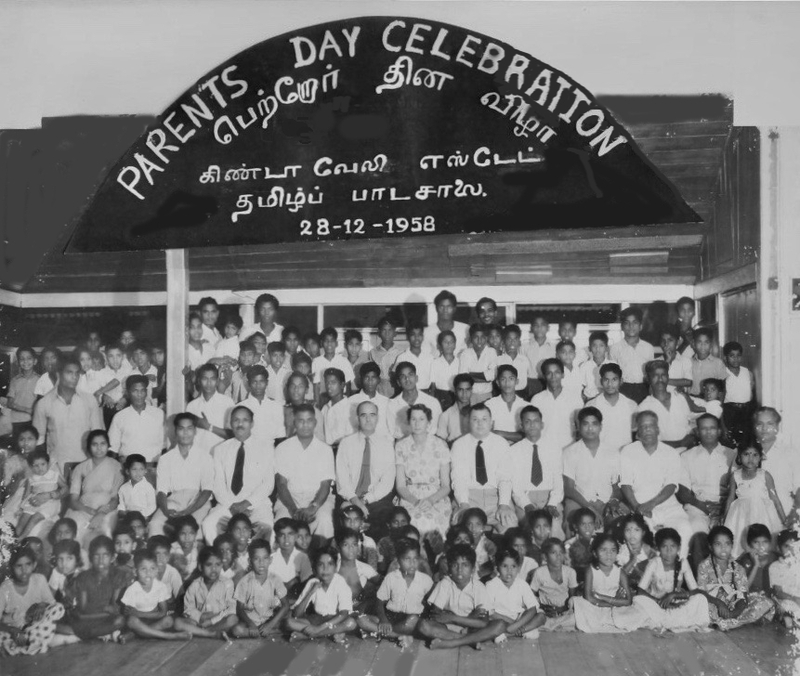 The Tamil primary school in the estate had dedicated teachers and good facilities, with Parents’ Days and school sports days organized on grand scale. Unlike most of the estates, Kinta Valley estate was right on the fringes of the main road, with efficient public transport. With this good transportation system made available many children of the estate workers went to study in English medium schools in Batu Gajah town situated about four miles away. Most of the residents worked as rubber tappers in the rubber plantation itself, while a sizeable portion of husbands worked in nearby tin ore mines. The estate is located within the Kinta Valley zone which had the richest deposit of tin ore in the entire world. The residents earned well, and poverty was not much prevalent by estate standards. This estate had 24 hours supply of free electricity, something rarely seen in other estates. The workers were financially sound enough to contribute to the screening of at least two movies in a month, screened by those operating mobile theatres. Peddlers selling all kinds of goods came to the estate daily and returned with good sales. There were public radio posts from the days of Second World War, which were discarded in stages as many workers started to have their own home radios. Some workers even owned cars like Morris Minor. There was a big and clean stream running right in the middle of the estate, in which people went for swimming, fishing and washing cloth. The estate management had provided huge lands for those interested to cultivate crops. Land was also allocated for rearing of cattle. Harvest festivals were organized on a large scale. Workers in this estate did not have to save much money in banks workers’ quarters provided. All these facilities the estate enjoyed were not to be easily found in other estates. To a large extent this estate occupied an eminent position and therefore drew the envy of nearby estates. Workers in other nearby estates were constantly on the lookout for opportunities to move into this estate. Residents of Kinta Valley estate were enjoying a happy life when the unforeseen happened from 1965. Price of natural rubber started to drop, and the management started to sell off the estate. Since there was no single buyer, the estate had to be fragmented. Overnight the fortune of the people was reversed. They lost their jobs and livelihood. In order to feed themselves and their dependents, they started doing odd jobs, or worked in in small holdings for a meagre wage. Some opted for working in nearby tin mines. But with the tin price also dipping, the tin mines were also fast closing down. They lost their laborer quarters and were given an option to buy them at a price of RM 300 per house. Since they did not have savings, they were allowed to secure their houses by paying installment RM10 per month. Education of children was badly affected. 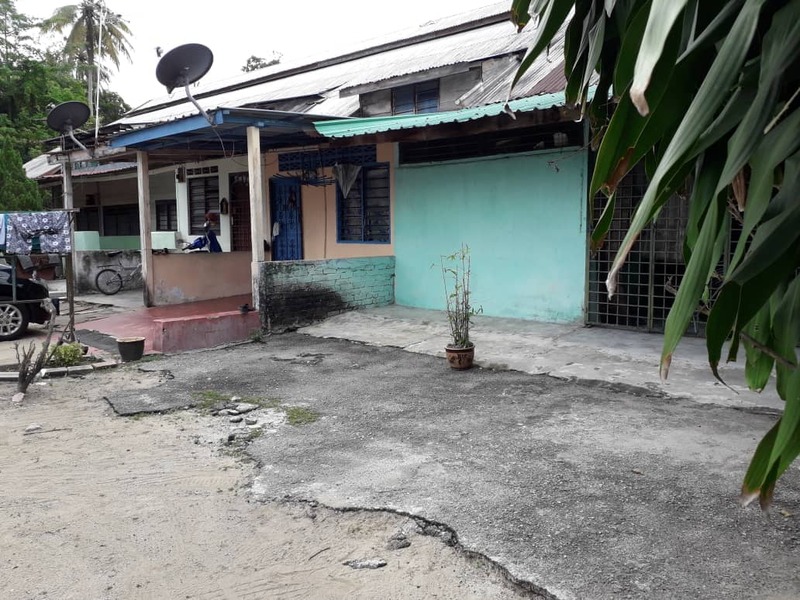 Some students who were studying in the Batu Gajah town had to stop education as their parents could not even afford sending them to school. They, along with many students in the Tamil school in the estate started taking up odd jobs at that tender age. Within a five-year period from 1965 to 1970 the once prosperous estate was reduced to a poverty-stricken village. By 1970 many workers had migrated to other places for livelihood. What was called “Kinta Valley Estate” soon became “Kinta Valley Village”. This was a period of utter hopelessness, and the people who stayed back in Kinta Valley village did not know what to do with their lives. The quality of life dropped drastically. The residents kept praying for some hope. I am not much inclined to mention my own bitter sufferings. At the height of the sufferings, I was only eleven years old and got to taste bitter poverty for the first time. Getting full decent meals was an uncertainty for every family, including mine. I lost a two-year-old sister all because of malnutrition or inability to provide medical attention. My elder and younger brothers started working at the tender age of 15. My parents were lamenting internally, unable to maintain the life they provided in those days. This was the time I turned to rely on the higher power. Although I was brought up the Hindu way, like most others, I did not know much about the Hindu teachings. For the first time I became serious in following a religious life. I took upon myself to clean up the prayer altar at my home where photographs of Hindu deities were kept. I gathered some youths and performed prayers and offerings at the “Sree Muneeswaran” Hindu temple at the main entrance of the village. While I was involved in some Hindu practices, I could not get into the meanings attached to those practices. I tried asking for explanations from elders, but they gave explanations which were often contradicting. While practicing Hindu way of life, I hoped to get some inner happiness, which was not forthcoming. This was the time when the Christian missionaries were frequenting Kinta Valley village to recruit people of Hindu Faith to attend their Sunday classes conducted in their churches in the nearby Batu Gajah town. They provided transport for those classes. When the residents underwent sufferings this same missionary group was kind to distribute packets of sugar, rice, milk tin, milk powder, lentils and other grocery items. I was taken up by their good gesture and started attending their Sunday classes, and got attracted to Jesus Christ. Had the missionaries had asked me to convert to Christianity, I would have gladly consented. I was on the verge of accepting Christianity but there was burning question within me that stopped my further indulgence into Christianity. I was confused as to why there were so many religions. My next desire was to investigate those religions to look out for the best among them for me to follow. I once again spent time attending Hindu classes, cleaning and painting local temples, carrying “kavadi” during a specific Hindu festival called “Panguni Uthiram” in Batu Gajah town. Carrying of Kavadi on the shoulders is a ceremonial sacrifice and offering practiced by devotees during the worship of Lord Murugan, the Hindu God of War. One carries kavadi by going into trance. It was believed that only those who are spiritual would be able to get into trance. As I was able to get into trance, I believed that I was a spiritual Hindu. My sincere prayers did not go to waste. In 1971, my very close and childhood friend Mr. Manisegaran, now settled in USA came to Kinta Valley village for a brief visit. Born in Sungei Petani town in the north, he came over and lived in Kinta Valley village for a very short period, and then moved back to Sungei Petani in mid 1963. We were playmates during our school days. Within that short visit Manisegaran dropped a bombshell – introduced to me to a new religion called “Bahá’í”. He then passed some Bahá’í pamphlets and a prayer book. He then went off after that lightening visit. That was the first time the Bahá’í Faith was brought to Kinta Valley. I did not read the pamphlets at that time, I simply did not want to. In 1973 Manisegaran came again for a wedding and stayed for two days. As he was leaving I followed him to the bus stand to send him off. While waiting for the bus he once again spoke to me in greater detail on the Bahá’í Faith. He asked me if I was saying the prayers from the prayer book he gave me. This time my ego prevented me from giving him a listening ear. I was already convinced that I had become spiritual on account of being able to get into trance. I felt I did not need any new religion. Manisegaran was insistent. He gave a few more Bahá’í pamphlets and asked me to reconsider my thoughts. I told him in frank and blunt words, “We are very close friends. But kindly forget converting me into another religion. It is you who have to reconsider returning to where you came from- and that is Hinduism”. Manisegaran gave a warm smile and boarded the bus. I walked home pondering deeply on that unusual smile that Manisegaran gave! But Divine Providence had its own way. I remember that fateful, and eventful day. On 14 December 1976 my close friend Arun Jayaraman and I went to Cameron Highlands on motorcycle to spend our holidays. On 16 December we rode back to Kinta Valley. It was raining all the way and we were completely drenched. We reached Kinta Valley at about 6.30 in the evening and went to our respective homes where we took hot shower to avoid getting fever. For reasons I cannot figure out, I went over to the house of Jayaraman and spontaneously we decided to go to visit friends in a place called Malayan Tin Dredging in Batu Gajah town. But it was still drizzling. Under normal circumstances, and anyone in a proper state of mind would never leave the house. Arun Jayaraman and I went on motorcycle to Malayan Tin Dredging and once again we were drenched in rain. As we reached Batu Gajah the weather was fine. Around 7.30 in the evening while we were in the company of our friends, some youths approached us and invited us for what they called a “fireside” at the bungalow of one Mr. Gopalan Nair. 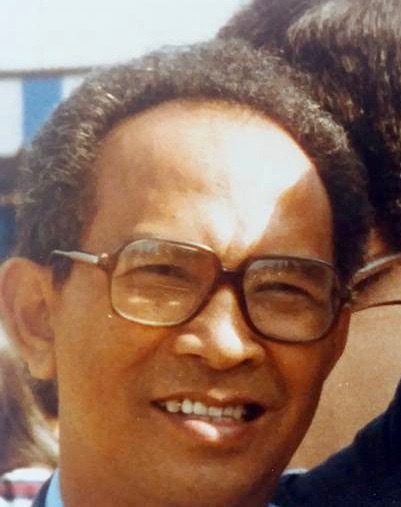 The youths were Aaron Young of Ipoh town now settled in the state of Sabah, as well as Remala and Nirmala, daughters of the late Mr. Nagaratnam. Arun Jayaraman and I to the Bahá’í Musical Fireside and paid much attention when they spoke of the principles of the Faith and the teachings. The principles of the Faith were very appealing for me. Some 32 friends accepted the Faith at that fireside. I asked some questions and received convincing explanations, and yet I was not sure of myself. Arun Jayaraman accepted the Faith, and I too signed up, quite reluctantly. On the same day Aaron Young informed me of the forthcoming Winter School to be held in the town of Port Dickson in December1975 and encouraged me to attend. I decided to attend the Winter School for one reason – to witness for myself to what extent the Bahá’ís followed what they preached. At that time, I viewed the Faith to be a utopia as I found the teachings too perfect. In December 1975 I was traveling on bus with Bahá’ís from Sungei Petani and Ipoh towns for the Winter School in Port Dickson. One Mr. C. Subramaniam, headmaster of a Tamil School in Sungei Siput town came with us in the same bus. The winter school atmosphere itself was simply electrifying, and that completely confirmed me in the Faith. I could see the believers were practicing what they preached. Manisegaran came to the Winter School on the second day. As soon as his eyes fell on me the first thing he said was “I knew you would accept the Faith”. At the end of the Winter School, Manisegaran gave me a task. He was at that time an undergraduate in the University of Malaya. He asked me to organize a fireside for my friends in Kinta Valley village in the month of May 1976. I gladly consented. Winter School, 1975. 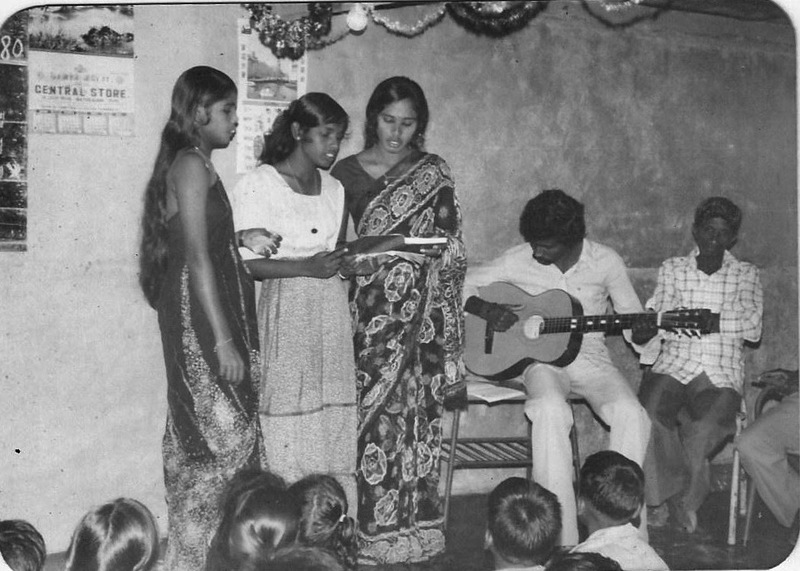 Standing (L-R) V. Rani, Nirmala, Remala, Andy, Kumar Rajagopal. In 1976 I fasted for the first time, which was a big challenge to me. Just before the fasting I wrote to Mr. C. Subramaniam of Sungei Siput and asked him to guide me on the timings for fasting. Since reply was not forthcoming, I followed Muslim style of fasting. When Manisegaran came in May 1976, I rounded up 16 friends and organized a fireside. Manisegaran spoke till late night. At the end of the fireside, all the16 youths accepted the Faith. One was Ratha from Hindu background and the other was Samynathan from Catholic background. Before leaving, Manisegaran informed us that he would get in touch with the believers in Ipoh town to provide the needed assistance for us. Now Kinta Valley had 18 believers altogether. That was a new beginning for all of us. The Faith came at the right time when the youths in the village had no direction in their lives. We started having basic Bahá’í activities such as deepening classes, children classes, feasts and teaching trips. Children classes became sensation among the workers who found a meaningful hope in these classes that gave a ray of good hope for the youngsters. I remember the first feast was held in the home of Arun Jayaraman. In stages most of our siblings too accepted the Faith. Among the first batch of youths. 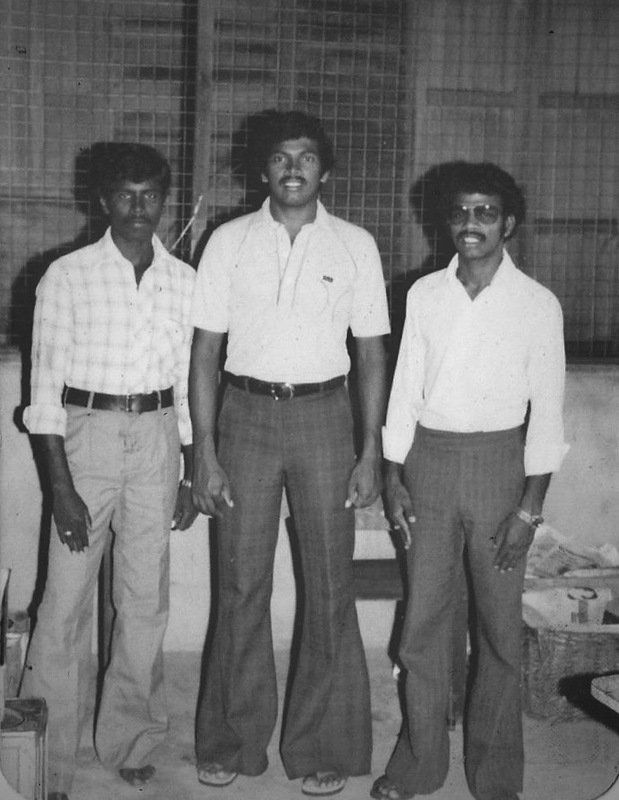 (L-R) Samynathan, Ratha and Dorai. 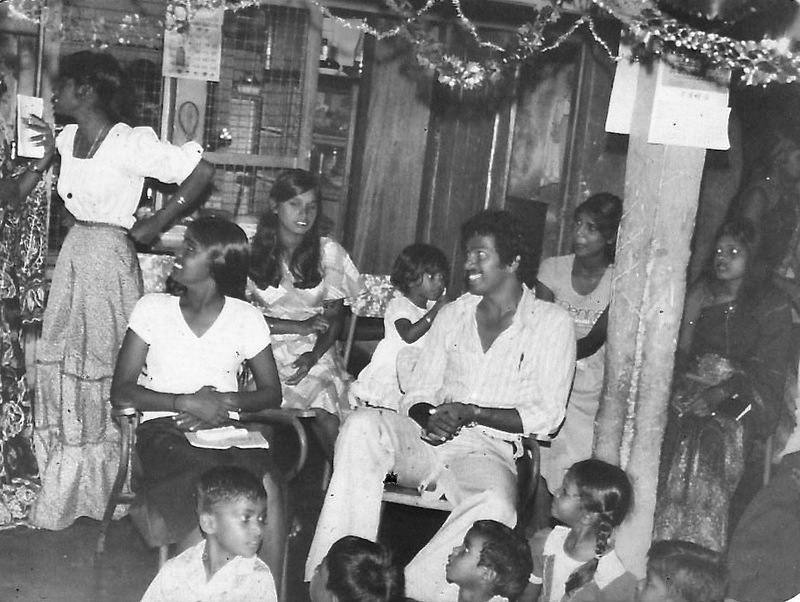 Ratha seated in the center at Naw Ruz celebration, 1977. Mr. C. Subramaniam, headmaster of a Tamil School in Sungei with whom I traveled to the Winter School in 1975 was about the first to come over to deepen us in the Faith. He was like a father to us and he nurtured us with all his love. Mr. Subramaniam used to stay in my home during weekends. Further assistance came from several other believers from Ipoh such as Mr. Y. Mari, Mr. Selvarajah, Aaron Young, Kumar Rajagopal, Asho Rajagopal, N. Perumal and Miss Vasugi. Aaron Young used to come with his guitar and taught us Bahá’í songs. Mrs. Theresa Chee, Auxiliary Board Member and eldest daughter of Mr. Yankee Leong the first Malayan believer visited us and encouraged us to go for teaching. We were mostly students. Knowing we would not have any money with us, she would quietly slip in a few dollars into our pockets for teaching activities. With that financial assistance I went to travel in the towns of Taiping and Parit Buntar. 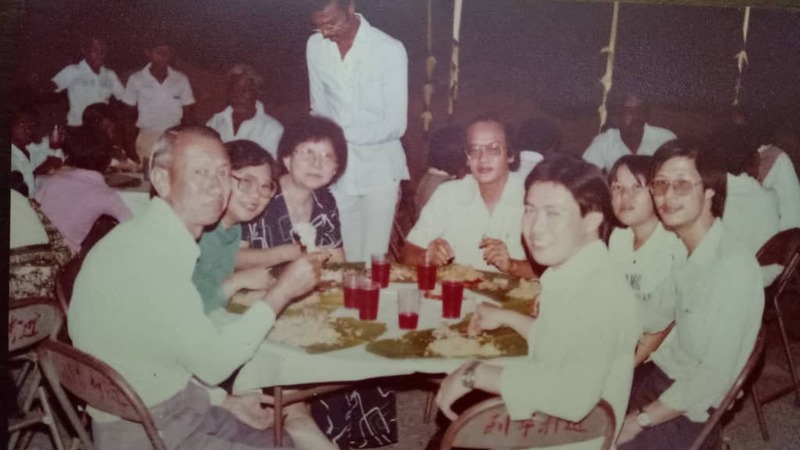 Second from right is Ashok Kumar from Ipoh at a Feast with Samynathan to his left. At extreme right is Ragavelu. Dorai is at extreme left. In 1977 most of the new Bahá’ís fasted. 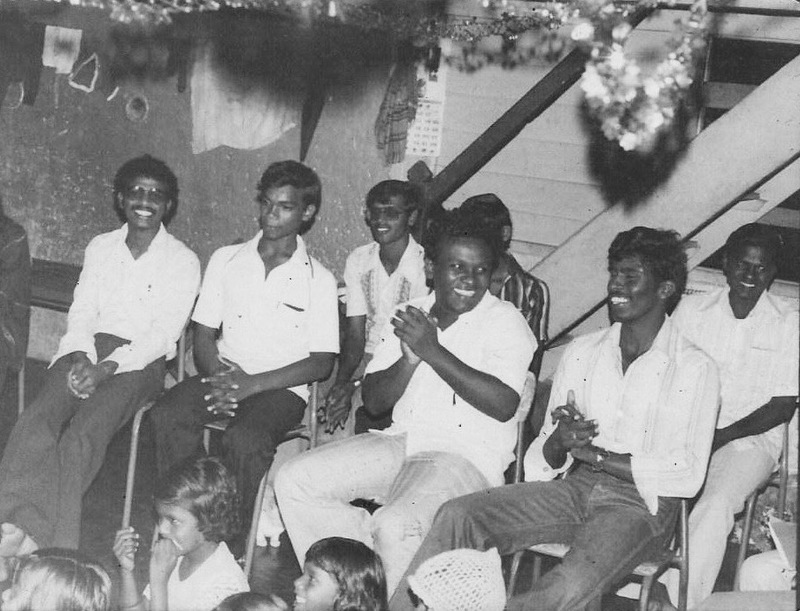 C. Subramaniam of Sungei Siput town visited Kinta Valley village just before Naw Ruz that year. He explained to us about the Bahá’í way of fasting. He then proceeded to discuss about the Faith with my father. Just before departing, he invited all the youths to go over to his house in Sungei Siput town to celebrate Naw Ruz. And he slipped RM 5 into the pockets of each youth. On Naw Ruz day we all went over to his house and enjoyed warm hospitality. As we were departing for the home of Theresa Chee in Ipoh, he once again slipped some money into my pocket and requested me to share with other youths to carry out teaching activities. We then went over to celebrate Naw Ruz at the home of Theresa Chee. She was only too happy to have us at her home. We did not remain silent on returning to Kinta Valley after celebrating Naw Ruz in the homes of C. Subramaniam and Theresa Chee. In Indian community there was always a tradition of slaughtering goats whenever grand events were celebrated. On Naw Ruz of 1977 my family slaughtered a goat and provided meal for over 200 residents of Kinta Valley to show that we Bahá’ís too have our own grand festival. That was a proclamation by itself. In the following year Dorai slaughtered many chicken and gave meals to a good number of people. Thereafter almost all Bahá’ís celebrated Naw Ruz with open houses. As activities were picking up in Kinta Valley, I had to go over to Ipoh town to study at the Ungku Omar Polyethnic School. But each weekend I traveled Kinta Valley to conduct children classes and give deepening. Each time I came back I was happy to learn that one of my siblings would have accepted the Faith. As a family, mine had the greatest number of believers. My parents were fully supportive of the Faith, though they did not accept the Faith. The youth started to organize themselves and soon turned out to be a dynamic set in the country. We formed the Local Bahá’í Youth Committee and started to function with great effectiveness. They were so active that several believers from outstation started to visit Kinta Valley Village. In Ridvan 1977 the local Spiritual Assembly of Kinta Valley Village was elected at the home of a believer called Mr. Kathirvelu. Most of the members on the Assembly slightly above the age of 21. Mr. Samikannu, father of a Bahá’í youth named Ratha had a grocery shop. Ratha had placed some Bahá’í pamphlets in the shop and many customers took home those pamphlets and read about the Faith. One elderly and well-respected person in Kinta Valley by the name of Nadesan was a friend of Samikannu. He used to visit Mr. Samikannu very often. One day Nadesan picked the pamphlet and read it. He then met up with Ratha who explained more on the Faith. Since Nadesan was of upright character and conduct, and very near to living the Bahá’í way of life, he immediately accepted the Faith. He then started to come more often and conversed with Ratha. Nadesan brought his wife and 9 out of his 10 children into the Faith. They all became very active in the Faith. Nadesan’s was the first family to have accepted the Faith. The coming of Nadesan’s family into the Faith was a major boost for us. His house was the first when entering Kinta Valley. His house too served as a kind of Bahá’í Center. Deepening classes took place almost every week in his house. 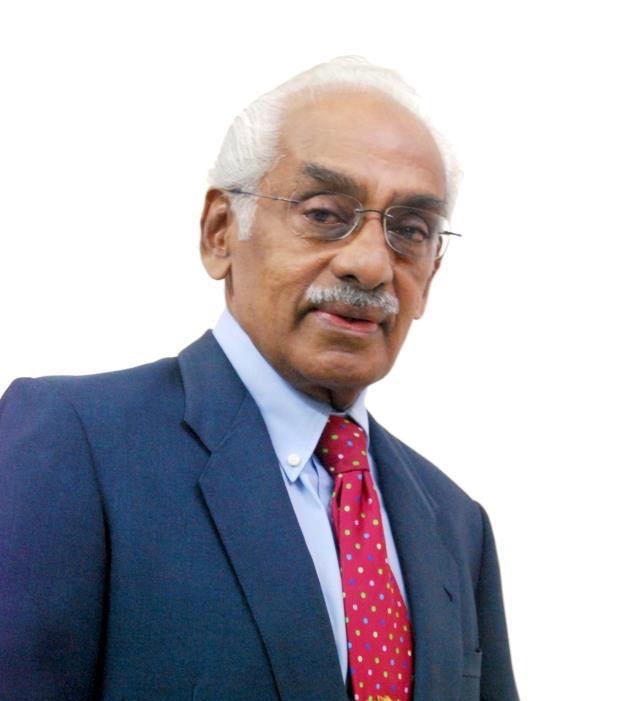 Mr. Nadesan , revered by all residents. By the late 1970s the name and fame of Kinta Valley must have spread all over the country. We had several prominent visitors coming to Kinta Valley. Among them were Auxiliary Board Members Mr. Rama Naidu from Bidor town and Dr. M. M. Sreenivasan from Petaling Jaya. Mr. Apppu Raman a retired senior government servant in Malaysia, Counselor Yankee Leong, the first believer of Malaya and Counselor Vicente Samaniego from the Philippines visited us. When Vic Samaniego visited Kinta Valley he spoke in English and I translated his talk. That was my first translation service in the Faith and it goes in till this day. 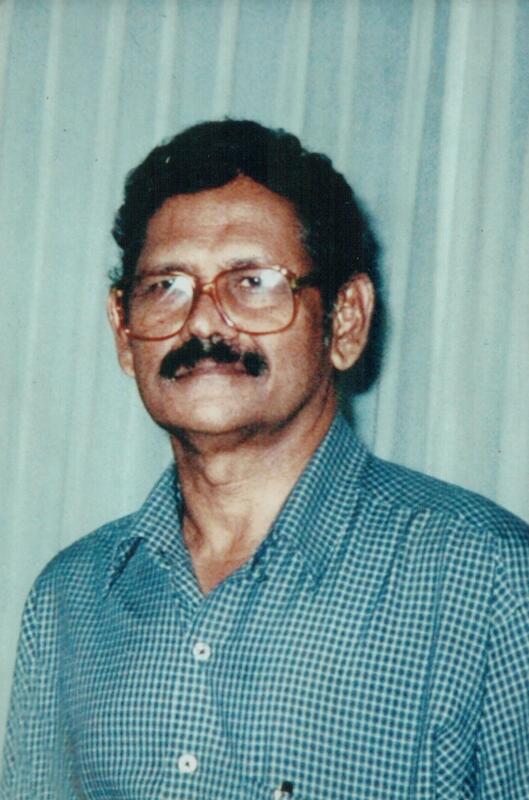 Rama Naidu used to boost our spirit by telling stories of the heroes of the Formative Age of the Faith. 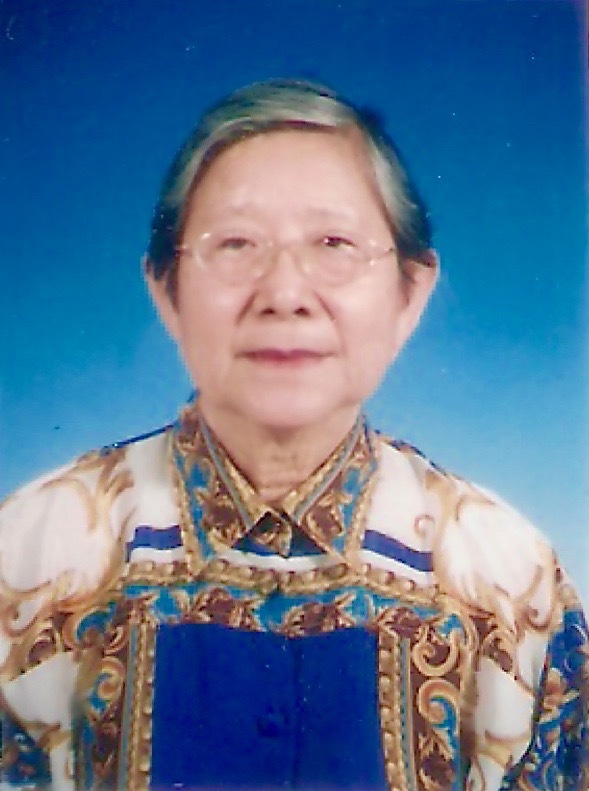 Theresa Chee is a retired teacher and she used to speak with us in simple English and Malay. Selvarajoo from Ipoh community affectionately called Selva had great affinity for Kinta Valley that he seem to have adopted this community as his personal goal area. He made numerous visits. Selva’s simple ways and ease with which he mixed with us won our deep love and admiration. All their talks had much penetrative influence in our souls. We were not only touched by the deepening they gave us, but the sincere love they radiated when consorting with us was what touched us most. The residents of the village had perhaps not seen such radiance from other visitors. They freely mingled with us, entered our homes and did partake of our food and drinks. All these were certainly observed by the residents who viewed them as a special breed of people. Meetings were usually held in the homes of Nadesan, Arun Jayaraman and my house on a rotation basis. But whenever large-scale gatherings were involved we made use of the Tamil School. The headmaster was so supportive of the Faith that the Bahá’ís gave him gifts during inter-clary days. These Bahá’í visitors gave us much guidance in transforming ourselves. Once Auxiliary Board Member Rama Naidu and member of the National Spiritual Assembly of Malaysia Mr. Isaac DCruz, now settled in UK came for a fireside. As the fireside went into late night, they stayed in the home of Arun Jayaraman. When they got up in the morning, the same enquirers came with more enquirers to hear more of the Faith. Fireside went on along with breakfast for all. Some of them accepted the Faith. 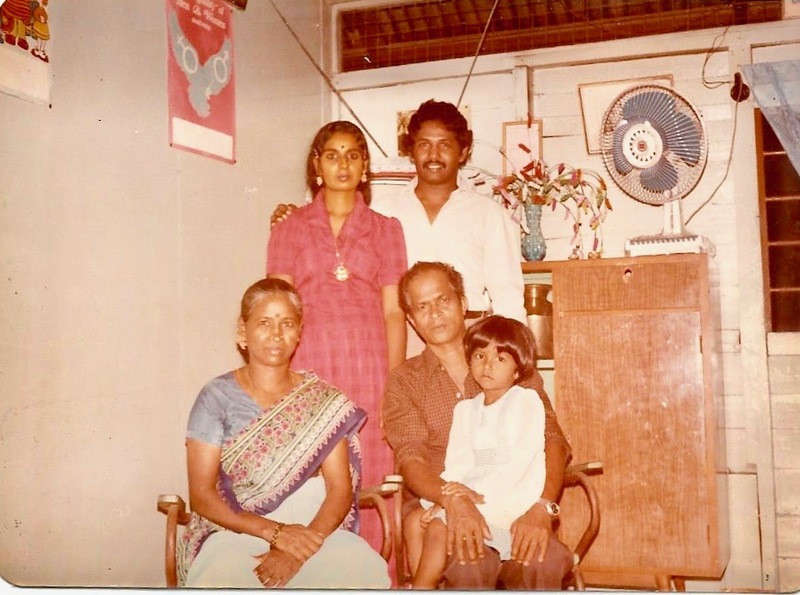 In 1965, as the Kinta Valley estate was being fragmented, Mr. Ragavelu came with his family from a town called Sitiawan and bought a house in Kinta Valley. He had a grocery shop in Batu Gajah town. He accepted the Faith with his family in 1976, and his entire family served the Cause actively. By the end of 1977 there were about 80 believers in this village. In 1978 we had more than 120 believers. Whenever we had to go for outstation activities we had no choice but to charter buses. Teaching activities became very regular. We went on bicycles or by bus to teach in the towns of Batu Gajah, Pusing and Tronoh. We also covered the big estates such as the Kampar estate and Kinta Kellas estate. Much later as we gained experience we even organized a Nine Day Teaching Campaign for the Chinese people in the nearby Chenderong Camp, which is a Chinese New Village. That was in November 1980. We rented a house of a Punjabi man in Chenderong for RM 30 per month for this campaign. The believers in Ipoh town came to support us. A word has to be said about the local heroines of the Faith. At first the ladies who came into the Faith took back stage and played supporting role. But as they got deepened and got a better understanding of the Faith things started to change. Puvanesway, daughter of C. Subramaniam of Sungei Siput, Vasugi, Vasantha and Mrs Suppiah of Ipoh along with Mrs. Theresa Chee gave them all the encouragement to come forward to take up equal roles with the males. Among those who served with distinction were Vichitra, Rani and Vasanthy the three daughters of Ragavelu, Kamalam daughter of Nadesan and Karpagam daughter of “Boy” Munusamy, and my own sister Indra. They came out of the grip of the typical Indian tradition and soon became front line workers. They served both on the Local Spiritual Assembly and Local Bahá’í Youth Committee at different times. At a much later period, Vichitra had served on the National Children Class Committee. Slowly and surely the Kinta Valley village Bahá’í community was etching out a name in the history of the Faith in Malaysia in its own way. We went on serving with all sincerity, and with no expectation. The National Bahá’í Youth Council had been giving out the “Rose of Ridvan Challenge Trophy” for the best performing and all-rounded local youth committee at the National Bahá’í Conventions from the year 1972. We were totally surprised when the Local Bahá’í Youth Committee of Kinta Valley Village was selected for receiving this coveted trophy for the year 1978. It was within two years of the formation of the youth committee that our youth committee won this trophy. Arun Jayaraman the first believer in Kinta Valley strumming guitar at a Feast. Holy Days were observed with dignity, where the village people were invited. All of us celebrated Naw Ruz within our means and invited guests from the village. The Faith received full publicity within and without the village when full Bahá’í weddings were held in the village. The first was that of Sunderaraju. Others who had full Bahá’í weddings were Mr. Veeraperumal, Miss Suseela, daughter of Nadesan, Ratha, Samynathan and I. The guests appreciated the simplicity and dignity with which the weddings were conducted. Appu Raman at extreme right conducting the wedding of Maniam to Suseela. Among those at the wedding reception. (L-R) Chee Ah Hin, Doreen Chee, Theresa Chee, Tan Boon Tin. A word must now be said about how opposition could not fully surface its ugly head. As the Faith was growing rapidly the Bahá’í elders from outstation who deepened us cautioned us to be wary of possible opposition from the residents, especially Tamil school teachers and temple authorities. We were vigilant. As the Faith was becoming popular there was some kind opposition fermenting. The parties that opposed the growth of the Faith instigated some parents of the Bahá’í youths. Admittedly some youth left the Faith. Yet such opposition made several of us remain very strong. 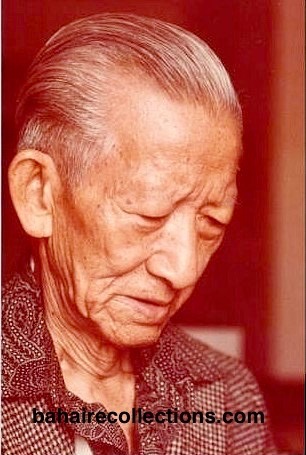 Mr. Samikannu, father of Ratha was quite disturbed and told Ratha that as a student Ratha was to concentrate on studies alone, and even threatened to send him to study in Ipoh town. Ratha politely said that he would be happier to go to Ipoh as the Faith was super active in Ipoh. With that answer Samikannu gave up on discouraging Ratha. It was learnt later that Samikannu was happy with the change that had come upon Ratha, that he allowed him to go his way. Mr. Vanathyah, Samynathan’s father Roman Catholic denomination too tried his best to persuade him to come back to Christianity, but Samynathan’s belief and Faith in Bahá’u’lláh had grown too strong to be dissuaded. Earlier when Samynathan was undergoing holy communion course in the Church of Our Lady of Lourdes in Ipoh town he became one of the best trainees. The church, knowing of his active involvement in the Faith planned to send him to India to become a pastor. By then C. Subramaniam had already spoken to Vanathyah of the Faith, and Vanathyah who appreciated the Faith left it to the decision of Samynathan. Of course, Samynathan chose to remain in the country to serve the Bahá’í Faith. Mr. C. Subramaniam has to be singled out for diffusing the opposition. He played a very great role by speaking to our parents about the Bahá’í Faith. With that they did not oppose the Faith. On the contrary they only developed respect for the Faith. Bahá’ís from outstation who were eminently placed in society came constantly and visited us. That too was a great factor in diluting opposition. But there was one other important factor why opposition could not take the upper hand. It was the transforming power of the Faith that did transform the lives of so many of us. Arun Jayaraman’s transformation was a miracle. He was seen as a notorious youth in Kinta valley village. 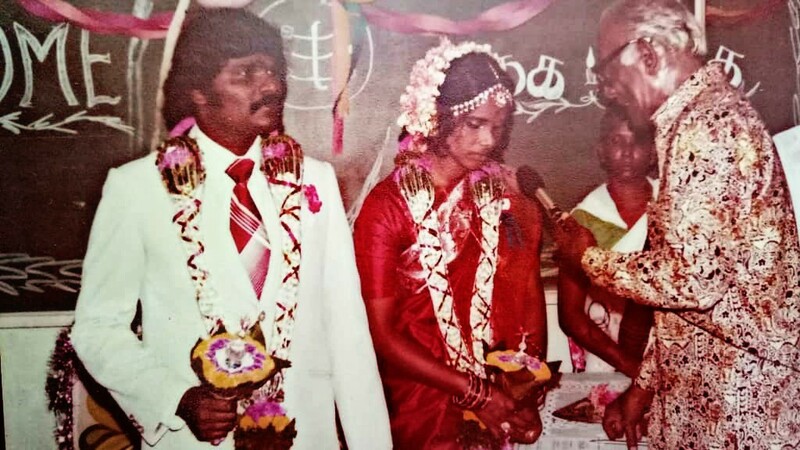 When he accepted the Faith, he was completely transformed into a new being altogether that some elders advised their children to follow the life of Arun Jayaraman. This reached the ears of Arun’s parents. His parents took a great liking for the Bahá’í Faith that they saw it a privilege to provide the best meals for visiting Bahá’ís and opened their home for Bahá’í activities. Arun Jayaraman himself bought the best cupboard and placed Bahá’í pamphlets and prayer books in it. Dorai Vethanayagam was another youth who was perceived to be totally mischievous. He was not much loved by the village people for his mischievous ways. He was a close friend of the Bahá’ís. When we first took the Faith to him, he openly warned us not to talk about the Faith to him; otherwise he would break our legs. On one occasion Bahá’ís came from Ipoh to Kinta Valley village. Heaving heard of their coming, Dorai quickly cobbled together his friends and employed every means possible to prevent them from entering the village. But his effort did not work well. One day he came for a fireside that C. Subramaniam conducted, and his heart melted that he accepted the Faith. He was soon transformed became an admirable and adorable soul in the village. And this came as a pleasant shock to the residents. He later became an effective member of the Assembly and served with distinction. Samynathan was seen as a fighter. Wherever there were open clashes taking place anywhere, Samynathan was sure to be in those places. Immediately upon accepting the Faith, he was a changed person. The Christian community from which he came saw him as a “born-again Christian”, not knowing the Source Which transformed him. The influential elders in the village happened to be parents of Bahá’í youths of good standing. 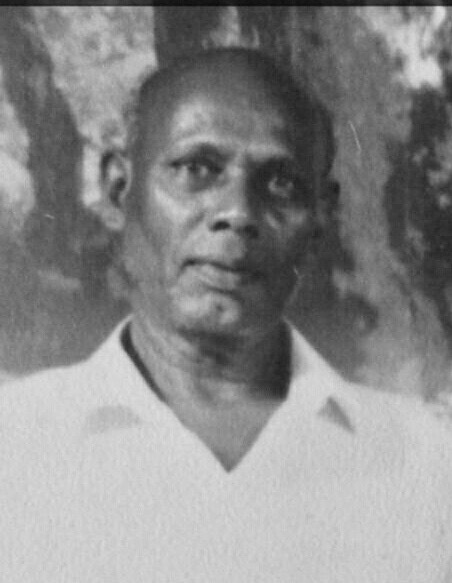 Arun Jayaraman’s father Mr. Ponnusamy was Chairman of a temple in the village. Nadesan who, together with his ten children became Bahá’ís was a much-revered person known for his pious life. The people in the village had a special respect for him. 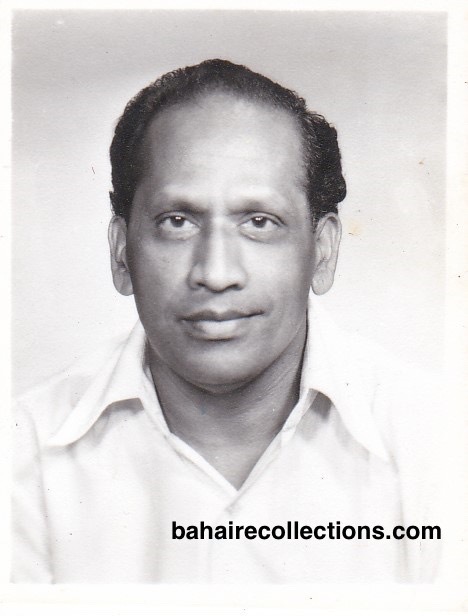 My father Mr. Chellamuthu was always sought for advice on community and family matters. He was a person of very strong character. The Faith attracted only more appreciations from these elders. There was no opposition from the parents when we placed the photograph Abdul Baha and the Greatest Name were hung on the walls of the living rooms in most of our homes. With my wife Neermala and my parents Mr. and Mrs. Chellamuthu. Sitting on my father’s lap is my niece Punitha, now married to Mark, younger brother of Samynathan, and both are serving the Cause actively in Kota Kemuning community. But the overriding factor that attracted the attention of the village was a painful process that we all went through. Right from the time we accepted the Faith, the elders who came to deepen us kept driving home the point that we all had to struggle to live a true Bahá’í life. We were told in no uncertain terms that we were all like candles in darkness, on whom the eyes of the village people would continuously watch. I am not brave to say that we all became saints, but all I could say is that we were conscious that we were all Bahá’ís first in whatever we said or did. That consciousness alone must have kept us on our toes to tow the Bahá’í line. I can bravely vouch for the character and conduct of the active believers in this village. There was no reported cases of believers smoking, drinking or indulgence in any vice activities that were rampant there. While some would not have accepted the Faith, the fact remains that they always had the highest respect for the believers. The Bahá’ís brought about dramatic and revolutionary changes. I am talking about the 1970s when the village was still immersed in age-long and fossilized habits prevalent in any Indian community. Division of residents along caste lines was very much engraved in the lives of the people of Kinta Valley. The Bahá’í Faith came as a revolution in the village and broke to thousand pieces all those fossilized caste divisions. I was told that caste clashes were common in the 1950s and 1960s. Before the coming of the Faith to the estate, the members of the management of the estate or the teachers would never drop into the laborer’s quarters. Those workers claiming to be from so called high caste would never enter the houses of the so-called depressed castes or consume food in their homes. Several efforts by outside organizations and influential people to reconcile the caste differences in Kinta Valley were total fiasco. But it was Bahá’u’lláh who did the impossible through we Bahá’ís. This alone became a big talk in Kinta Valley village and nearby places. We believers mingled with each other as members of the same family. We Bahá’ís boldly and openly eliminated caste consciousness among us, leading to intermarriages in many instances. Dorai, Arun Jayaraman and I decided to start some kind of service to the people. We started a wet market, and it ran so well with customers flocking to the market. We made sure business practices were in accordance with Bahá’í ethics and we made only marginal profits as a form of service to the village people. We were the first to introduce purchasing in credit, to be settled at the end of the month. The people started to call it “Bahá’í Market”. The fortune of the Faith in the village started to decline in the 1980s as most of us started to leave for jobs and livelihood elsewhere. As for the key believers, in 1978 Samynathan left Kinta Valley village to join the Police Academy in Kuala Lumpur. That was a reluctant farewell. One mini bus full of Bahá’ís from the village sent him to the Batu Gajah railway station to catch the midnight train to Kuala Lumpur. He still continued having touch with Kinta Valley village. He came back in 1991 to have his Bahá’í wedding there. After serving in the police force in several parts of the country he is today settled in Ipoh town and serving on the Assembly there. Ratha left the village in 1978 to work in Johore Baru town, Banting town and a few other places in senior administrative positions in private concerns. 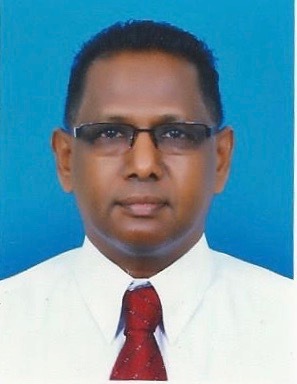 Ratha had served as Chairman of the National Spiritual Assembly of the Bahá’ís of Sri Lanka while working there and is today well settled in Seremban town. In 1981 left Kinta Valley village for training in Johore Baru and have settle there since. I was appointed an Auxiliary Board Member in the state of Johore for two terms. Today I am on the Local Spiritual Assembly of Johore Baru. In 1981 Dorai went to the state of Sabah as an administrator in a Japanese firm and served there for five years. From Sabah he went to travel teach in Sarawak and married a local native girl and is settled there. He worked as an administrative manager in the oil and gas sector before retiring. Dorai always boasts that his experience as Secretary of the Local Spiritual Assembly had trained him to be a good administrator with which he was able to secure sound jobs. Arun Jayaraman left the village for Singapore in 1985 and later moved into Petaling Jaya. Today he is one of the most successful car sales managers in Petaling Jaya and is settled in Seremban town. Mr. Ragavelu’s family was the last to leave Kinta Valley. When he passed away in 1982 he was given a full Bahá’í burial in the Hindu burial ground in the town of Batu Gajah. His family too moved out of the village sometime after his passing. With all the believers leaving the village one by one, it was Nadesan’s family that kept the torch burning. When his family too left for Pasir Gudang town in the southern part, it created a vacuum never to be filled. At the time of writing this story Kinta Valley does not have a single Bahá’í residing there. What was once a boastful vibrant community is today reduced to a small village with a meagre population of mainly old people, supported by their children who are working outstation. My house with blue walls, as it remains unoccupied today. Was once used as a Bahá’í gathering place. But Kinta Valley village had its own role. The rise of the Faith was meteoric and short lived. We were well grounded in the Faith and deepened in the writings while in Kinta Valley thanks to the elders who guided and showed the way. I am happy to say that the believers who migrated from Kinta Valley are all doing well wherever they are residing now. More than that they are all well respected in their respective communities. And their children too are doing well in their studies, come up well in their careers and are serving the Faith well. Sad to relate, those who failed to accept the Light of the Day or opposed it are in somewhat a despondent situation. It was in Kinta Valley that the Message for the Day wafted over us. We were all awestruck at all those wonders that happened there within a short span of time. The prime period of our lives was spent in Kinta Valley. It was there that our hearts were filled with immense wonderment as the power of the Faith of the Blessed Beauty unfolded right in front of our eyes. As I look back it appears that Kinta Valley was a breeding ground for us for some specific purpose – to set up Bahá’í colonies elsewhere, which is what we seem to have done. We may be out of that “Valley of Wonderment” but our minds often travel back to those olden, and golden days! I read with great interest your story on the growth of the Faith. It was so exciting I read the entire account in one go. It gave me a clear picture of the early days and life in Kinta Valley Estate. But importantly the story of how the Faith started at Kinta Valley estate and how all of you were actively involved in serving the Cause are matters of great admiration. I can see the youths really moved around brought growth to the Faith. By and large, there was a widely held view that students or youths from estate environment do not go very high in education or careers. But not for Kinta Valley. You all have done well-only too well wherever you are residing these days. The secret is blessings from the Blessed Beauty. You took care of His Cause, and He took care of your cause. And thanks for publishing a group photograph that contains me as well. I never had a copy. A very well written chronology of the events in Kinta Valley. I used to attend Summer Schools and Winter Schools where many of the participants used to talk of the greatness of a community in Kinta Valley. You have now given first hand information on what exactly went on in Kinta Valley. That community has produced several steadfast believers who are today shining stars in various part of Malaysia. Thank you so much for this great write up on the meteoric rise of the Faith in Kinta Valley. Reading your write up has really filled me with so much wonder and admiration for the believers in that village. All those details and beautiful pictures- I am just wondering where you got them from whom and where. I must admit I do not remember meeting you much, and the so many names you mention in your story, I don’t know who they were. I am not familiar with them at all. But your narration brings them to life. Somehow I felt I knew some of them. You have with gratitude mentioned all those elders who had assisted in the development of Kinta Valley. It is news to me that our dear Manisegaran brought the Faith to Kinta Valley. Kuna, the description of your early struggles and all the fantastic Bahai activities made me want to cry. The contribution of the early believers in energetic Bahai activities was most praiseworthy. The story of Kinta Valley Estate penned by Kunasegaran is very inspiring. It portrays a living example of the process of the development of the Faith in a rubber estate community in Malaysia. Kinta Valley Estate with strong Hindu community that once enjoyed abundance of comfort and prosperity could with a snap of economic turn-down reduce to an impoverished state overnight. On the other hand there is a lesson learnt. This story portrays how the economic crisis in due time has led the youth to a hope in life- the Bahai Faith. From the story I am able to pick up spiritual victories, unity in the community and progress in the life of individual believers. The pages of the world’s history attest to the facts that often crisis have been followed by victories. I have come to Malaysia a number of times, but did not have the opportunity and the honor of visiting the Kinta Valley Estate community. But from this vivid story by Kunasegaran, I can feel the perseverance, determination, commitment and the devotion of those Baha’i friends. The outstation friends – Dr. Sreenivasan, Rama Naidu, Theresa Chee, Yankee Leong, Selva who had deepened them are to be commended- they were among the spiritual giants in the country. My one time colleague Counselor Vic Samaniego has also visited this community is news to me. Kinta Valley friends are indeed lucky to have been deepened by these great souls. I would like to thank Mr. Kunasegeran for writing this beautiful story that I believe shall remain as a precious testimony of the power of the Faith of Bahaullah. I take this opportunity to sincerely thank Mr. Manisegeran for publishing this excellent story in the blog and for being himself an instrument of bringing the Faith to Kinta Valley Estate. What a great story you have written. I became a Bahai in Sungei Siput town north of Kinta Valley, through my late brother Nehru in 1983. He used to mention of the greatness of the Bahai community in Kinta Valley. It is most unfortunate that I was never able to visit your community. The regret has escalated ten folds, nay hundred folds after reading this story. The story unfolds like a novel with all the dramatic events, turning points, climax and of course the achievements and more than that the key characters in the story had played significant role. I have not read a novel for some years now, and that thirst seem to have been quenched to some degree by your story. Among the believers mentioned in the story I have known you, and as a positively charged believer. I am sad I had no opportunity to meet up the rest of them. All of you have been the real torch bearers for the Cause of the Blessed Beauty in Kinta Valley which undoubtedly had a role to play. Although I found the story slightly long, the excitement in reading the story pushed me to complete reading it on one sitting over the computer. The well selected photographs are not only catchy but add value and significance to your story. This is one of the best stories I had read in this blog. It took me down the memory lane, and brought back the much spoken and well admired spirit of those days, which I believe would not be returning into our lives with the same tempo. And of course Kudos to our living historian Manisegaran for running this blog. I am very much impressed by this story that has many stories to tell. I can see the Faith was very well received by the estate people at a time when poverty had crept into the estate. That was a wake up call for the residents to look for some hope and if not for the Faith what other hope could they have got? Sometimes wake up calls could be crude, but the end of things is always blessings in abundance. The story tells of how you had accepted the Faith, with some reluctance and reservations. This is normal, and that includes my own situation. When one signs up he or she does not necessarily become a star servant. We all need some confirmation in the Faith. Your trip to the Summer School had confirmed in the Faith. As for me there was this late Jamie Subramaniam who used to push some money into my pockets and urged me to attend summer schools. I was a student then. Again these summer schools confirmed me in the Faith. We all need mentors or spiritual fathers to be well grounded in the Faith. Kinta Valley had a host of spiritual giants visiting and deepening all of you. It is not easy to come out from the grip of age-long traditions and live a Bahai life in any homogeneous community. You all made it possible only through getting a deeper understanding of the Faith. The unity that prevailed among you is something that is most admirable in every way. This story takes me to the very kind of atmoshpere I was in when I accepted the Faith in an estate community. It looks we all had the same kind of problems challenges and opportunities. It is indeed sad that Kinta Valley has no believer now. As you rightly said, Kinta Valley had its own role in training all of you to be serving elsewhere in Malaysia and abroad. And I can see all of you are well taken care of by Bahaullah. Thank you for writing a very detailed and interesting story on the growth of the Faith in Kinta Valley Estate. This Estate has truly produced many steadfast believers who are serving in different capacities in different parts of the country. I have known most of those unsung heroes of the Faith. But your story provides the noble services you all have carried out in the estate. I remember meeting the estate believers in the home of Mr. Nadesan almost each week in 1977 and 1978 to conduct deepening classes. I was proud to see a set of dedicated youths. My heart would always melt whenever I observed how Mr. Nadesan had a good understanding of the Faith even at that old age. He was indeed God chosen to be a father like figure for the youths. It is simply nostalgic to call to remembrance those momentous days that are never to be repeated. Thanks for the blog which has preserved for posterity all those details which have hitherto not made available to the public. It is truly a historical blog that keeps us reminding of past events. My appreciation to Mr. Kunasegeran for writing about the early history of the Faith in Kinta Valley Estate and its surrounding areas. Kunasegaran is a close friend of mine in the same community as mine, and he is basically a down to earth believer. 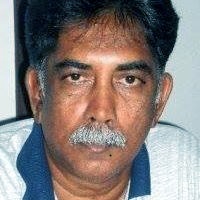 However it is through this story that I have known for the first time the role that he and his close friends like Dorai, Samynathan Ratha and Arun Jayaraman had played in the growth of the Faith in Kinta Valley. That was a community in which the youths took a leading role. And yet they had in their midst a well respected elderly person – Mr. Nadesan who was a fatherly figure for them. I was happy to learn that my Mr. Nadeson my father in law had played a pivotal role in his own way in serving the Cause in that community. He was a proud father to have brought in all his 9 children into the fold of the Faith. I have heard of some of the estate communities in Malaysia which had carved out special names in the area of service. But to my humble mind, Kinta Valley seem to occupy a unique place in the history of the Faith. Interestingly it is news to me that our Baha’i historian Mr. Manisegaran had lived in Kinta Valley Estate for a few years. Again thanks to Mr. Kunasegeran for his great effort in writing this interesting piece of article and taking us back in time to a place called Kinta Valley. I was born in Sungei Petani, Kedah and my family moved into that estate when I was still a small child. It was in the middle of 1963, at the age of 8 that I moved back to Sungei Petani. It was only a short spell in Kinta Valley. 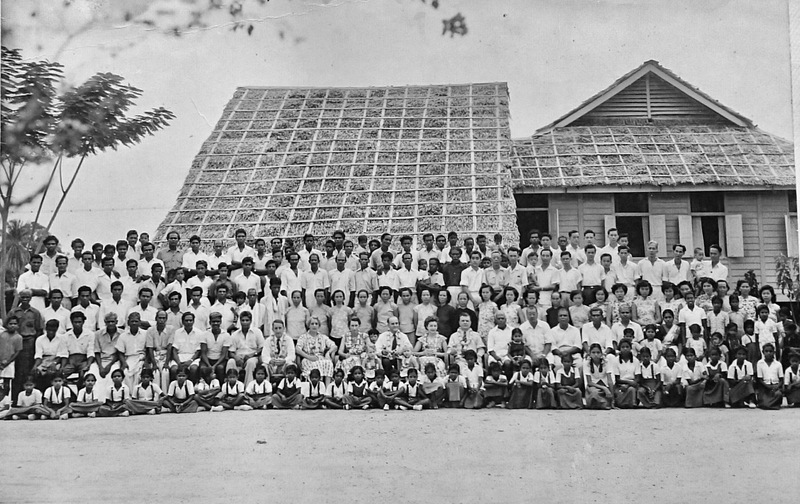 A truly remarkable account of early believers in a remote estate in Malaysia. Those early Bahais are truly the unsung heroes of the faith. I was very impressed with the story and thank Kunasegaran the author for giving us a detailed account of the history of the Faith in the early days. This is a story of interesting episodes with many challenges, sacrifice, steadfastness and heroism- all rolled up together. The story deserves in every way to be shared with our children and youths to motivate and inspire them. I have made a few trips to Kinta Valley community, on the invitation of Mr Samynathan to join for prayer sessions in the home of his parents. I admired the steadfastness of the believers there. All along I thought it was just one of the active communities in Malaysia. But after your write up about Kinta Valley, I am led to understand of the greatness of the community and its rich history. We need more of such stories to look back, reflect and get inspired. Reading the history of the Faith is most inspiring to me, next to reading the Holy Writings. This blog is full of inspiring stories. REPEAT those teaching efforts put up by the friends before. play our part well to tap the resources of our youths. I firmly believe the time is ripe for such an effort. Thanks and Allah ‘u’ Abha. I read with immense interest your beautiful story on the development of the Faith in Kinta Valley estate and how all of you grew along in the Faith. I believe no other estate would contain such a thrilling episode with so many turning points and challenges and opportunities. You should come out with a book on what you had written by expanding some angles. You have mentioned a number of names most of whom I know personally. But I never knew they all grew in the Faith in this place that you have mentioned.